This page is being 'stored' on this blog, the domain name pointing here, to preserve continuity. This page deals with a very specific version of the game, often known as ‘Merde de Tete' or, more commonly, ‘Leeds Rules Shithead'. Shithead is sometimes known by other names, I have heard it called ‘Karma' in the south of England, and I believe it is also know as ‘Palace' in some parts of the world. This version of the rules have been tried and test and were formulated and finalised, around the basic game, during the Autumn and Winter of 1995, at 41 Cliff Road, Hyde Park, Leeds, West Yorkshire, LS6 2ET . It has been played this way for nearly 15 years. Shithead is a game without ‘winners', only a looser, in which the players try to avoid being the last to get rid of all their cards and, therefore, the ‘Shithead'. 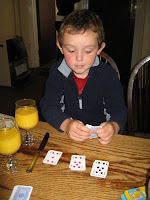 The loser typically suffers some minor forfeit, such as having to make a round of tea/coffee, being lightly mocked for their poor luck or incompetence, or at least (minimum, but complusory) has the job of shuffling and dealing the next hand. 2–6 people are required, using a normal 52-card single deck of cards, for a single game. The game is best with at least 3 players (2 player games lack the option to employ any real tactics). There are no reason why larger groups cannot play, but beyond six two packs of cards should be used, and more packs for multiples of six thereafter. However, the larger the game the slower the game, and each player will see less 'action'. The cards rank highest to lowest: 2/5+, A, K, Q, J, 10, 9, 8, 7, 6, 5+, 4, 3, 2 (2's are high and low, 5's become their preceding higher card, we will discuss this later in Special Cards and Plays). For the first hand of any session the dealer is selected randomly. For subsequent hands the deal falls to the ‘Shithead' (or looser) of the previous hand. Any cards remaining undealt are placed face down to form a draw pile (or stock) and the top card of the pile is turned over to act as the first card of the game discard pile. Each player may now pick up their hand of three cards and look at them. 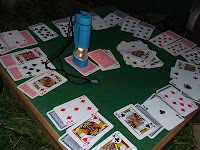 This is done BEFORE the players have exchanged face-up cards with the three cards in their hand so that the first player has the option to play against the first card strategically (see below). The players pick up their three card hands and look at them. Before play each player may exchange any number of cards from their hand with their own face-up cards. A player may never look at the face-down cards until they are played. Players invariably take lower ranking face-up cards into their hands and assorted strategies are planned and put in place at this point. A card is turned over from the top of the face down remaining cards and becomes the first card of the discard pile. The first player is the person on the left of the dealer, in the same direction one would apss a bottle of Port. The first player continues the discard pile on the table, playing face-up from her hand a card equal to or higher than the card currently on the top of the discard pile. Multiple cards can be played, but only if they are identical rank (e.g. two queens or three jacks). The player then draws a number of cards from the draw pile equal to the number of cards played. u hold of a single type (i.e. playing just one Ace when you hold 3 could be most beneficial to your long-game). If a player picks up the discard pile, the next player has effectively a free table, and can play whatever she likes. You must replenish your hand with the same number of cards you have just played. If there are too few cards in the stock (or draw pile), you draw as many as there are left. When there are no cards left in the stock at all, play continues as before, but without replenishment. If you find yourself (during or at the beginning of your turn) with no cards in your hand (because you have played them all), you may now play from the face-up cards in front of you. When you are playing your face-up cards and cannot play a card of equal or higher rank than the card(s) played by previous player, you DO NOT add one of your face-up cards to the pile before taking the whole pile into your hand, you just take the pile. It is then the next player's turn to begin a new discard pile by playing any card or set of equal cards. Having picked up the pile, you will have to play from your hand on subsequent turns until you have once more got rid of all your hand cards and can begin playing from your table cards again. When you have played all your face-up table cards, and have no cards in your hand, you can now play your face-down cards blindly, pulling any one card into your hand when your turn comes (but not until, for reasons of 'showmanship'). If the card is playable, it is played, and it is the next player's turn to equal or beat it. If your card is not playable (because it is lower than the previous play etc. ), you take the whole pile into your hand including the new card, which does not have to be shown to the other players. It is then the next player's turn to start a new discard pile. Having picked up the pile, you will have to play from your hand on subsequent turns until you have once more got rid of all your hand cards and can choose your next table card. When you completely get rid of all of your hand and table cards, you have successfully avoided being Shithead and can drop out of the game. When you play your last table card, you can only drop out at that point if it beats the previous play (or if you are playing it to an empty discard pile). If your last card is not playable, you must pick it up along with the pile. As people drop out of the game, the remaining players continue playing. 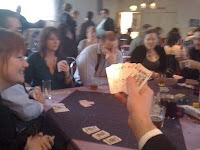 The last player left holding cards is the loser (also known as the 'Shithead'). This player must deal the next hand, and/or must also make tea (or perform any other agreed minor duty the group require for general comfort and wellbeing). A five may be played on any card, but must be accompanied by a higher card at the same time. Other special cards can be played with a five, in multiples if available, but must still be higher (so not a 2). Multiple fives do not require multiple higher cards. The value of the five, for the purpose of the next player, becomes that of the higher card that is played with it. A seven is played on an equal or lower card , the next play must be lower than or equal to a seven. Stashing 1 - a ten may be played on anything lower, in multiples if appropriate. When a ten is played, the discard pile is removed from play (or ‘stashed') and the same player who played the ten takes another turn, playing any card or set of equal cards to start a new discard pile. Stashing 2 - if someone completes a set of four cards of the same rank (this still being a set of 4, or more, in a multi-deck game) on top of the discard pile (either by playing all four cards at once or by equalling the previous play), the whole pile is removed from play (or ‘stashed'), and the same player who completed the four of a kind takes another turn, playing any card or set of equal cards to start a new discard pile. Accusing people of cheating is a serious accusation, and should not be done unless you mean it. If someone is believed to be cheating by all referees then they are a cad and should horse whipped accordingly. There is a Facebook page for players and fans of Leeds Rules Shithead, here. Thanks.